Home » Recipes » Appetizers » Don’t Like Spinach? Try this! Don’t Like Spinach? Try this! On my husband’s side of the family they have Age Related Macular Degeneration, the leading cause of blindness. So I’m always trying to get green leafy veggies in my family’s diet any way I can. Eating these foods most days of the week is important for prevention of ARMD. The only problem… they’re not big fans of green leafies that are readily available, prewashed and convenient – like spinach. So here was my solution this week–which was well received and gone in a day! I should have made more. Used an emersion blended to blend right in the pot. If you don’t have one, transfer the soup to a food processor. I asked for an emersion blender for Christmas. It eliminates one more thing to wash! Everyone ate it and no one added salt. It was a very thin soup. You could add corn starch to thicken it if you like. No one is a big fan of spinach at our house, but they all enjoyed this soup… and I’m happy to protect my family’s vision! Find more ways to get your kids and family to eat veggies. Comment on Don’t Like Spinach? Try this! I am always looking for quick, easy and healthy that hubby, daughter and I will all eat. Thank you! I’m looking forward to trying this and some of your other suggestions! This sounds like a great recipe that my kids will enjoy. Love your tips for helping keep our kids healthy! Thanks!! I have been trying to get my friend to eat spinach for months. I will definitely give that soup a try and hopefully she will like it. 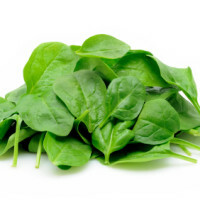 Not many people enjoy spinach or vegetables in general, it is so great that you provide these wonderful tips for us to use. Thank you! Fabulous recipe! Always looking for new TASTY recipes for parents, so their children will eat more veggies! Good stuff! Awesome! Great idea for getting in those spinach leaves, yum. What an easy and quick recipe not just for young families for for anyone who needs to up veggie intake (isn’t that all of us!) Keep these recipes comin……. That sounds really interesting…I’m going to try it this weekend. Good idea- thanks! Another idea is to try spinach loaf (my daughter loves it): Mix about 2 cups cooked rice with 2 beaten eggs, a box of chopped frozen spinach (thawed and drained), salt and about a cup of shredded cheese. Place in loaf pan. Bake at 350 degrees for 45 min. to 1 hour. Fantastic! We need more this kind of creative recipes. Looks very delicious. Sounds really good, I am huge fan of spinach myself! … I will definitively give it a try!